A good website redesign is about more than just improving the look and feel of a website. It’s about employing a strategic marketing plan and making smart decisions along the way. After all, any successful online marketing campaign begins with the company website. However, this process can be a bit overwhelming to business owners, and quite frankly, we don’t blame you for feeling that way. We’ve been there and we know, website rebuilds can be quite the process! So today, we’re sharing 10 simple steps that ensure your website rebuild is as strategic as it is stylish. If you’re looking to redesign your website, then obviously there’s a thing or two you don’t like about it… So what is it exactly that you like and don’t like about your website? As your evaluating your website, be sure to factor in your site metrics and A/B testing to see what areas of your website are performing well. Once you’re aware of what’s working and not working, you can incorporate specific goals into your next design. We recommend writing these goals down and referring to them throughout the design process. What’s a buyer persona? Simply put, a buyer persona is a representation of your ideal customer based on research and data about your existing customers. A website rebuild is the perfect time to revisit and reassess your buyer persona. These profiles will determine the voice of your content, the style, and simplicity of your website. Imagine buying a brand new, beautiful car with the shiniest exterior you’ve ever seen, only to find the interior of the car is old, smelly, and beat-up. Gross, right? That’s what a new website design with old content is like to your visitors. A website rebuild should be paired with a thorough and honest reevaluation of site content. Some content may need some quick revising while other content may need to be cut completely. Just be sure that all of your content is up-to-date and harmonious with your company’s current vision. After you’ve cleaned up your content, it’s time to organize your content into a site map. What categories will be on your main navigation bar? Will you include a drop down menu? These are all questions to consider when designing a map for your website. Once you’ve got a clear site map in place, it’s time to write content. This process includes not only your main body content, but also call-to-action buttons, descriptions, forms, and any other holes your previous content is missing. This is where your website design comes in. Wireframing lays out where elements will appear on a webpage. It is essentially the stacking and hierarchy of your design layout. This can be done on something as simple as a white board all the way to designing them in Photoshop or with a fancy wireframing software. This is where we start to make things pretty. Design mock-ups incorporate colors, fonts, graphics, and photos into a website design. This process is typically done with a design software such as Photoshop. At this point your content is edited and catchy, your design is crisp and clean, and your strategy is focused on moving visitors down the sales funnel. That means it’s time to hand everything over to a coder. Edit and proofread… Again and again and again. There’s nothing worse than a glaring typo staring potential customers’ in the face. This is also a good time to make sure you finalize your URLs and 301 redirects for any old pages on your website. 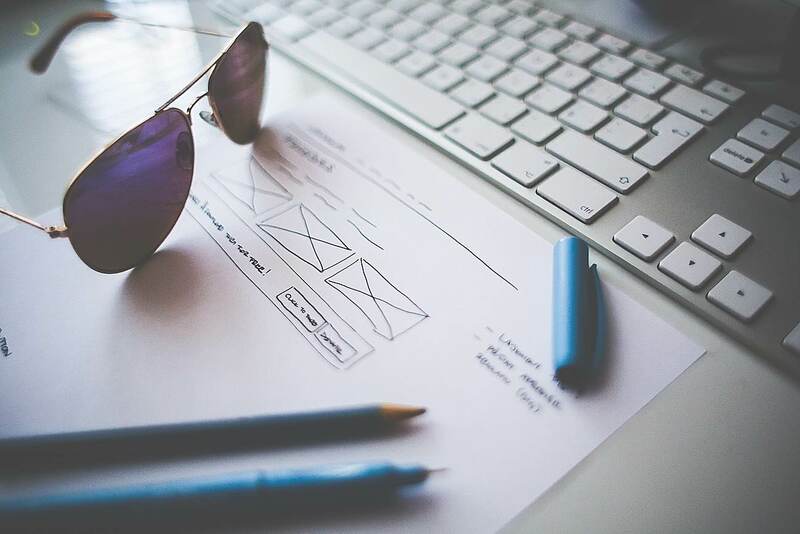 Before you it’s time to hit “publish” on your new website design, ensure that your content is clean and that you thoroughly troubleshoot your website to make sure your users have a great experience on your site. Once you’ve made sure everything is working well, your site is ready to go live! Set a launch date and run with it! Of course, you’ll want to be prepared for any bugs or unexpected issues or problems. Once your website is live, double check and make sure everything is working properly. Well there you have it! A website redesign in 10 simple steps. And don’t forget, if you need any help along the way with strategy, content, design, or development, we’re here to help!